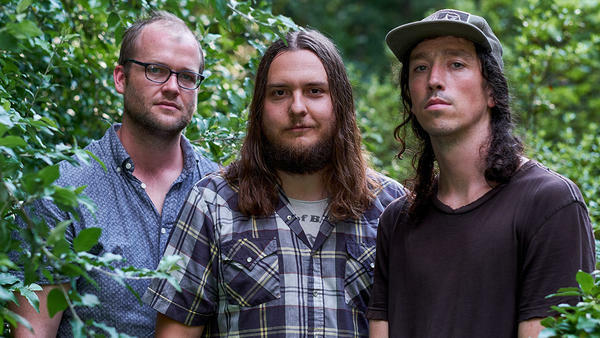 Nathan Bowles' (center) new album, Plainly Mistaken, comes out Oct. 5. For his fourth album, Plainly Mistaken, Bowles expands to a trio for five tracks, featuring double bass player Casey Toll (Jake Xerxes Fussell, Mount Moriah) and drummer Rex McMurry (CAVE). From the first moments of "The Road Reversed," a melody spirals outward from Bowles' rhythmic banjo, heavily bowed bass and rolling percussion. The piece was originally written in 2016 while he was on tour with Steve Gunn, but really only took shape when Bowles began to rehearse with his new members. As the 10-minute track evolves, there are moments of punk-driven percussion and elliptical melodies turned all the way around, but its simultaneously ecstatic and droning composition recalls moments from A Monastic Trio by Alice Coltrane, another experiment in mixing up the trio format from 1968. Like Coltrane, Bowles tears open a tiny piece of fabric in the folk music continuum to let in the cosmic debris. Plainly Mistaken comes out Oct. 5 via Paradise of Bachelors.